Just before the Jewish Passover Jesus went up to Jerusalem, and in the Temple he found people selling cattle and sheep and pigeons, and the money changers sitting at their counters there. Making a whip out of some cord, he drove them all out of the Temple, cattle and sheep as well, scattered the money changers’ coins, knocked their tables over and said to the pigeon-sellers, ‘Take all this out of here and stop turning my Father’s house into a market.’ Then his disciples remembered the words of scripture: Zeal for your house will devour me. The Jews intervened and said, ‘What sign can you show us to justify what you have done?’ Jesus answered, ‘Destroy this sanctuary, and in three days I will raise it up.’ The Jews replied, ‘It has taken forty-six years to build this sanctuary: are you going to raise it up in three days?’ But he was speaking of the sanctuary that was his body, and when Jesus rose from the dead, his disciples remembered that he had said this, and they believed the scripture and the words he had said. During his stay in Jerusalem for the Passover many believed in his name when they saw the signs that he gave, but Jesus knew them all and did not trust himself to them; he never needed evidence about any man; he could tell what a man had in him. Why is Jesus angry – they have missed the point and the religious leaders are allowing this to happen! Religion has come down to ritual, and the centre is missing. Jesus was not much at home in the temple. He went there sometimes, and always caused trouble. 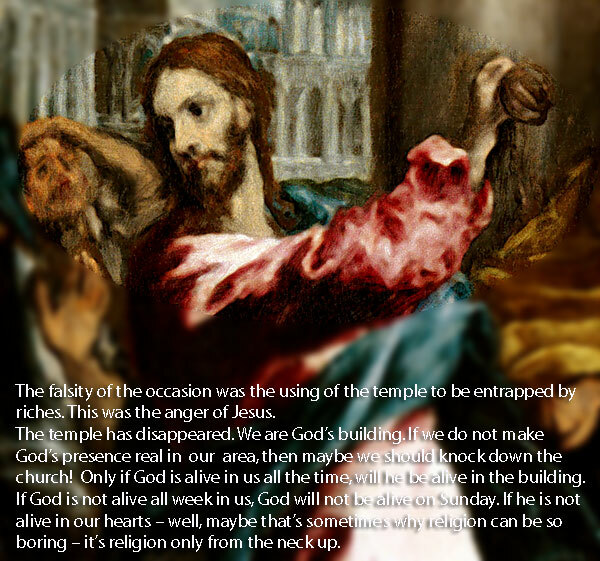 The finding in the temple, the words – my body is the temple. Jesus is more at home at the table – the loaves at the lake, the fish on the beach, the last supper in a home. This is where he is most himself. The falsity of the occasion was the using of the temple to be entrapped by riches. This was the anger of Jesus. The temple has disappeared. We are God’s building. If we do not make God’s presence real in our area, then maybe we should knock down the church! Only if God is alive in us all the time, will he be alive in the building. If God is not alive all week in us, God will not be alive on Sunday. If he is not alive in our hearts – well, maybe that’s sometimes why religion can be so boring – it’s religion only from the neck up. Where people meet, there is the temple of God. The AA centre, family life, the groups who want to improve life for others, the group that prays. What angered Jesus was using God for our own purposes. For trade and greed. The forty six years are over, and the three days of the rebuilding have been going on for years, in the hearts of all who are faithful to God’s love. The building continues still and we are the living stones. This entry was posted in Gospel of John, Gospel Reflection, Liturgy Resources, Prayer Resources, Scripture, Year B and tagged Beloved, Body as Sanctuary, body as temple, Donal Neary SJ, Gospel Reflection, Gospel Reflection for 8th March 2015, Jesus, Jesus in the temple, Jewish Passover Jesus, John 2:13-25, living church, living stones, March 8th 2015, Passover, Scripture and Reflection for 3rd Sunday of Lent Year B.